Visit Ford for more information on the Ford E-Series. 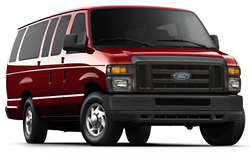 The Ford E-Series has been America's favorite full-size van for the last 29 years and it's hard not to see why. With its many model types from cargo vans to cutaway and stripped chassis there is a model for every commercial need whether it's delivery, construction or shuttle bussing. The E-Series van is available in many models - the E-150 XL, E-150 XLT, E-350 Super Duty XL, E-350 Super Duty XLT, E-350 Super Duty Extended Length XL and E-350 Super Duty Extended Length XLT. The instrument panel and center console have been redesigned for 2009 to give a more user friendly experience. The interior is very customizable depending on your needs from a two seat interior for cargo vans to 8, 11, 13, or 15 passenger seating for transporting people around. The driver's seat is available in either cloth, vinyl or leather. Available on all models are a Reverse Sensing System and a Rear Backup Camera System. The exterior of the E-Series is fully customizable as well - several choices of door and window combinations are available depending on the need and the length of the van is selectable by the regular, Super Duty Regular Length and the Super Duty Extended Length chassis. The windows are made with solar tinted glass and privacy glass is available for passenger vans. There are four engines to choose from for the 2009 Ford E-Series - a 225 horsepower 4.6L Flex-Fuel Triton® V8, a 255 hp 5.4L Triton® Flex-Fuel V8 , a 305 hp 6.8L Triton® V10 and finally a 235 hp 6.8L Powerstroke Diesel V8. Depending on the engine the transmission will either be a 4-speed automatic or a 5-speed TorqShift automatic. Standard safety features for the E-Series include - Second Generation driver and passenger airbags, Tire Pressure Monitoring System, Power 4-wheel ABS brakes remote keyless entry and an anti-theft system are available as options.